Roderick Russell was a bit shocked by just how personalized the ads on his Facebook page were becoming. In the right-hand rail he started seeing messages for cures to a unique malady of his—he's a professional sword swallower but has trouble swallowing his vitamin pills without gagging. So this ad was a little too close to home: "Trouble swallowing pills? 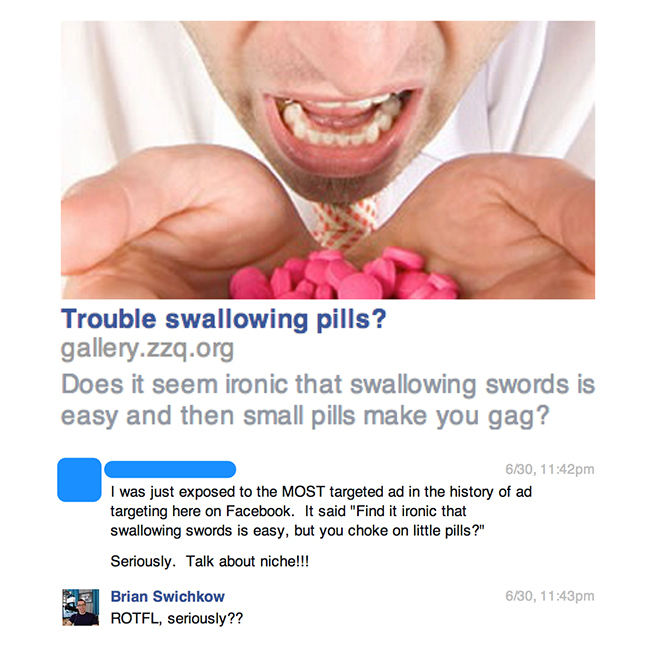 Does it seem ironic that swallowing swords is easy and then small pills make you gag?" It seemed to be a case of Facebook knowing way too much about him, but how? He posted to the social network that he had just seen the "most targeted ad in the history of ad targeting." And it wasn't the last. He received a series of increasingly personalized marketing messages that started to make him paranoid. It turned out, however, the ads were well-placed pranks by his roommate, Brian Swichkow, who used Facebook's ad targeting tools called Custom Audiences to build a campaign geared to one person. Swichkow told the story of his marketing hoax on Reddit last week and received a ton of attention for his new blog: mysocialsherpa.com. Redditors applauded his ingenuity. Swichkow, 27, is a marketing pro, and he's familiar with buying Facebook ads. The joke was also a way for him to test the boundaries of social media marketing and hyper-targeting. Another marketer called it "niche to one" messaging, which can be quite effective not just as a joke but also as a way to generate sales. "I asked how targeted I could make my audience," Swichkow explained in his blog post. "I said to myself, 'What if I only had like five people in an audience? What if I only had one person in an audience? I should test this. I should test this on my roommate.'" His sword-swallowing roommate was seeing other weird ads, like this message next to a phallic image: "So you like swallowing things? You're in luck because we have an amazing deal for you!" Eventually the roommate became too paranoid. He thought his digital life was being tracked and even stopped talking on the phone for fear he was being bugged. Swichkow finally admitted the prank. In a phone interview, Swichkow said he is still testing the most effective tactics to generate clicks on social media and drive traffic to sites like his blog. He uses Twitter and Reddit, trying different approaches for maximum effect. On Facebook, he uses Custom Audiences, the program for marketers to upload their contacts and find them on the social network. When Swichkow started his one-to-one marketing campaigns, he was allowed to just input one target. But Facebook has since made it so that you need at least 20 people on your marketing list. Still, he's found loopholes, like if you're targeting a man, include 19 women in your list and then set the campaign to reach only males. Swichkow said he likes "pushing the boundaries, seeing how I can break things." He found valuable lessons in his hyper-targeting methods that could be valuable for any marketer who wants to reach a specific consumer but not be too creepy with overly personal references. "I was never direct and always 'fired shots across the bow' so that he wouldn't feel targeted—even though he was being targeted (this is by far the best way to market to a small audience)," Swichkow wrote. "I wanted it to appear that he was finding the ads and not that the ads were finding him." Peter Tompson, a digital brand strategist who found Swichkow's post on Reddit, said that niche-to-one marketing is controversial but effective, especially in business-to-business marketing. When one sale could mean hundreds of thousands of dollars, reaching the right decision-maker could be key, Tompson said. He's actually writing a book in which he recommends compiling dossiers on potential customers and their social media habits; writing blog posts targeted to their particular interests; and buying online advertising "addressed to just one person." "Focused social media like this is a delicate art, and the risk of spooking the prospect is so great," Tompson said in his own blog post on the subject. “Social media allows your digital sales teams to stalk your customers with an accuracy that we've never seen before," he says. Or you could just mess with your roommate.